Today Facebook Has connected billions of people in the world. Facebook has become an very important aspects in any one’s life.Sometimes some important messages on Facebook May Get Deleted On facebook Accidentally. So in this Tutorial I will Show you a method to recover deleted messages/Photos/Friends lists on Facebook.So Bymistakely If you deleted some important Messages/Photos,etc.Don't Panic because Facebook permanently stores your all data which includes Photos, Messages,etc. The best thing is that they allow us to download a copy of this data in a zip archive format. So below is the simple Guide to Get a archived Backup Of your Facebook Data. Step1:To initiate,First Go to Facebook.com and login your account. Step2:After logging,Now Go to this link to navigate to your Facebook settings. Step3:Now You can see your general settings. 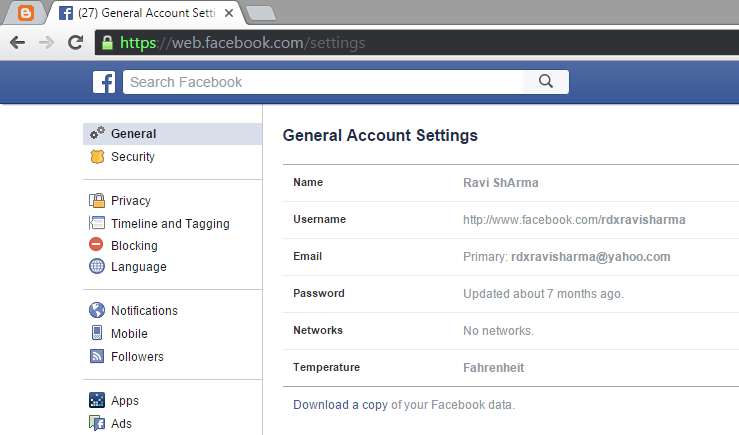 Go to bottom Of that page and click on Download a copy of your Facebook data as shown below. Now a page will open And from here you can see a list which will get downloaded during this process. Step 4:Now click on Start My Archive. Now After clicking on Start My Archive button a popup will Open where you need to enter your current password of your Facebook account. After that click on submit button. Step 5: Now Again you need to click on Start My Archive button to start downloading Your Zip file. After finishing this step, Facebook will send you a copy of your all data to the email which you are using on your Facebook account. This email comes in the social label/folder of your email account. If the email doesn't comes Then wait for 5minutes.within 5 minutes you will receive a email which is titled as Your Facebook download is ready. Step 6: Now Click the link which is highlighted in the above picture to download your Facebook data. For security reasons it may ask you to enter your facebook password to download your Facebook data. After downloading Zip Archive of your Facebook data,extract it using WinZip or 7zip or any Zip extracter. After extracting, launch index.php file which is in your Facebook data folder. This will automatically Open your default browser.Mostly Open with Chrome.Now,Here you can access your all Facebook data And the data which you have deleted previously.